This delightful and heart-warming book tells the story of Teddy, a baby bear who becomes lost in the woods while on a picnic with his parents. Lonely and frightened, Teddy is crying under a bush, when Amy, a little girl who lives in a log house near the forest, discovers him and takes him home. That night, she snuggles with the furry little bear and they both fall asleep peacefully. Teddy enjoys honey treats, a special red sweater knitted by Amy’s mother, napping by the fireside, and playing with Amy and the neighborhood children. One day, Teddy sees two large brown bears at the edge of the forest, watching him roll in the cool grass. He recognizes his parents, runs to snuggle with them, and returns to his home in the woods. Amy is so sad and lonely without him, that her mother decides to make the little girl her own little brown bear, out of some furry material. When Amy’s friends see it, they all want one, and soon the town is full of Teddy bears in all the colors of the rainbow. 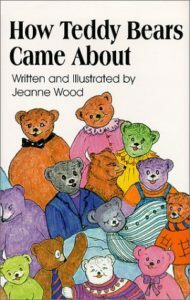 Beautifully illustrated in full color, How Teddy Bears Came About is recommended for all children and adults who have had, or would like to have, their own Teddy Bear to love and cuddle.